Below are some of the highlights of the group benefit plans available to most full-time, U.S-dollar paid employees at ConocoPhillips. This is not intended to be a summary plan description or official plan document. Please see official plan documentation for complete details on our current benefit offerings. Regular base pay (including overtime for non-exempt and hourly jobs). Annual cash bonus based upon company, business and individual performance. Eligibility for Restricted Stock Units at certain grade levels. Coverage assists with health necessities from wellness to catastrophic events. Options include two High-Deductible Health Plan options (HDHP Base & HDHP) . Medical options include a prescription drug benefit. Provides preventive care and more comprehensive coverage like major dental and orthodontic procedures. Pays for non-work related disabilities for up to 26 weeks at either 100% or 60% of pay (dependent on years of service). Basic benefit option provides 50% of your pay. 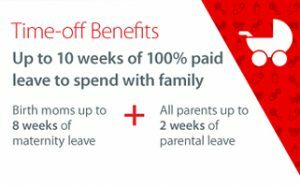 Enhanced benefit option provides 60% of your pay. ConocoPhillips provides basic life insurance equal to your annual pay. Optional supplemental term life insurance is available up to 8 times your annual pay. ConocoPhillips provides $500,000 in coverage. Optional coverage available for employee, spouse and children. Employees must contribute at least 1% of eligible pay each pay period to receive a 6% company match with a potential 0%-6% additional company discretionary contribution, which will be based on factors such as company performance and market conditions. Participants are always 100% vested in their contributions, the company match and the discretionary contributions. In addition, employees are also eligible for a Company Retirement Contribution (CRC) of 6% of eligible pay each pay period. The CRC does not require any employee contributions. After three years of service, participants are 100% vested in the CRC. Paid Time Off for vacation, holidays and family illness. Health Care Flexible Spending Account (HCFSA). Dependent Day Care Flexible Spending Account (DCFSA).